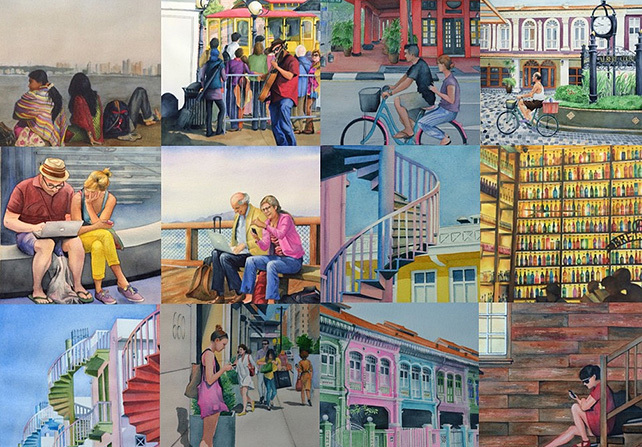 Moments in Watercolour is a collection of watercolour paintings that celebrate the beauty in images we see every day. The play of light and shadow created by a circular stairway, the memories hidden behind the ornate details of a shophouse or even in a humble bicycle. Through her work, artist Kavita Rajput invites you to see the world through her eyes, to take a pause to notice the ordinary and even if just for one moment, experience the magic in the everyday. Included in the exhibit is the ‘Never Alone’ series where Kavita attempts to capture us as we go about our lives, always connected, always online. She aims to bear witness to our fleeting times and capture the ubiquitous mobile phone before it becomes a thing of the past!